Kobelco Construction Machinery America recently joined the crew of “Extreme Makeover: Home Edition” for a project in eastern Texas. The company provided a Kobelco SK210 excavator to demolish a home so that a new one could be constructed for a deserving family. McElroy has introduced Hydraulic Clamping retrofit kits for the popular 500 line of fusion machines. The new introduction comes after a successful introduction of the same product for 412 and 618 fusion machines last year. ARIES Grout Systems are designed and built for continuous operations. ARIES TV/Grouting Systems are productive because of the reliable, maintainable and adaptable components utilized in an integrated configuration. HOBAS pipe’s high strength-to-weight ratio, smooth surface and flush, push-together joints are ideal for sliplining. Burst and replace water, sewer, gas and other pipes with the Grundoburst static pipe bursting system from TT Technologies. URETEK's Zero Excavation inflow and infiltration solution is a quick, efficient, low-impact, repair solution that deploys an expanding, hydro-insensitive, high-density polyurethane foam to seal, encapsulate, and stabilize infrastructure systems. The ubiquitous, low fences around perimeters of construction sites are so common these days they don’t draw the attention they once did. Every construction site on which the earth must be excavated or otherwise disturbed has one or several such fences, but their function often is misunderstood. The second annual Tulsa Pipeline Expo will be held Sept. 1 – 3, at the historic QT Center, formerly known as the International Petroleum Expo building at the Tulsa, OK, fairgrounds. The Tulsa Pipeline Expo (TPE) was created in 2009 and designed to showcase the thriving industries of energy and infrastructure in the Tulsa area, said TPE President Shawn Lowman. Drive past most any construction site, and there’s a good chance many of the machines working there are rented, clearly marked by decals of the rental company that owns them. Most construction specialty niches rent equipment, including utility providers and contractors engaged in underground utility construction. Most sewer infiltration enters structurally sound sewer systems through joints, manholes, service connections and the first few feet of the service lateral. This infiltration adds to treatment costs and increases the risk of sanitary sewer overflows (SSOs). A proven and economical way to permanently stop these leaks is with chemical grout. For the 15th year, the Center for Innovative Grouting Materials and Technology (CIGMAT) and the Department of Civil and Environmental Engineering hosted a one-day conference on "Construction, Geotechnical, Hurricane and Flooding Issues in Houston & Other Major Cities" at the University of Houston on April 23. More than 280 attendees consisting of owners, consulting engineers, material suppliers, contractors and academia attended and participated from across the U.S. In the spring of 2008, a reliability engineer at a major oil refinery contacted Inspar Robotic Technologies Inc., regarding concerns about the continual microbial corrosion problems they were encountering. The facility was experiencing multiple perforations in a progressive sequence from the effluent source in their hydrocarbon pipelines. When Doosan Infracore Construction Equipment acquired Bobcat Company in 2007, many wondered how the long-distance relationship with the South Korean manufacturing giant would work out. Now, almost three years later, the answer is clear. Bobcat is reinvigorated and aggressively improving their equipment while continuing to expand the product lines. Utility districts understand that water and sewer pipes deteriorate over time. This is especially true for concrete pipes installed in sanitary sewer systems. An inherent issue with sewage is the build-up of hydrogen sulfide (H2S) gas, which can have far-reaching effects that may not be noticeable until a major problem occurs. “Why don’t they just put everything underground?” It’s a question heard repeatedly after major storms knock out vital power and communications services, and one that utilities often were asked after last winter’s storms left hundreds of thousands of Americans without electrical power. Pure Technologies Ltd. announced July 28 that it has agreed with the shareholders of The Pressure Pipe Inspection Company Ltd. (PPIC) to purchase all of the issued and outstanding shares of PPIC for up to $34.9 million in cash and common stock of Pure. Both companies' boards have approved the transaction, subject to certain conditions and to the approval of the TSX Venture Exchange. The transaction is expected to close by August 31, 2010. Since 1966, DFI Corporation has supplied the oilfield construction industry with first-class pile-driving, pile supply and trucking services. As the core business for DFI, oil and gas have provided the company with significant growth and success; however, the seasonal nature of the oil and gas industry means that projects are not balanced throughout the year. Business updates from Ritchie Bros., John Deere, Miller Pipeline, CONTECH, WilsonMiller, Sukut Construction, AEM, Dexter + Chaney, Spectrum Construction Software, GEI Consultants and Cardno TBE, plus web exclusives from Ledcor, EPRI, PPI Solutions and Millennium Pipeline. Committed to providing their customers with the products and solutions they need to succeed in business, Vermeer Corporation has newly redesigned the company Web site — Vermeer.com. 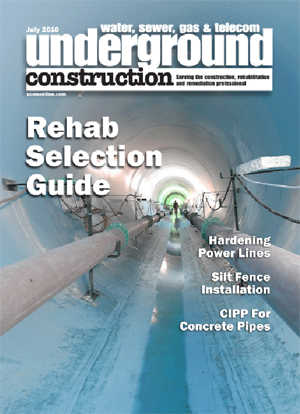 Advertisers in the print edition of <em>Underground Construction</em>, July 2010, Vol. 656 No. 7. Environmental Crossings Inc. (ECI) announced June 3, that long time shareholder Bruce Brasher has purchased all of the outstanding shares and has assumed the position of president. Greg Charney of Lone Star Investments Corp., The Woodlands, TX, was advisor on this transaction and sourced the needed financing. KSEnergy Services announced that CIVC Partners, in partnership with True North Equity, has acquired an interest in KSEnergy Services. CIVC is a 40-year-old Chicago-based private equity firm with over $1.3 billion under management and a long history of investing in highly successful, closely held businesses. True North is a Detroit-based firm that makes investments in utility maintenance companies. Caterpillar, Inc. announced July 1 that it has acquired all assets of Underground Imaging Technologies, Inc., an advanced geophysical services company and technology developer based in Latham, N.Y. The acquisition will give Caterpillar the capability to provide geophysical services, specializing in providing three-dimensional representations of underground utilities and other targets. <strong>SAWS rate-hike plan spurring opposition </strong>Under a proposed new rate increase by San Antonio Water System (SAWS), businesses that use a lot of water to irrigate their properties could see their bills increase from 45 to 65 percent. The rate increase is slated for investment in much needed infrastructure. More urban areas throughout the United States are facing growing pressures on their water infrastructure systems, necessitating both greater investments for overhaul and a change in development patterns that are more conducive to conservation, according to Infrastructure 2010: An Investment Imperative, a new publication released by the Urban Land Institute and Ernst & Young. <strong>Insituform wins contracts </strong>Insituform Technologies has been awarded two contracts with a combined value of $6.5 million from the Hallsdale-Powell Utility District in Knoxville, TN. These contracts mark the first time Insituform will work with Hallsdale-Powell, which will fund the projects with a state revolving fund loan secured through the American Recovery and Reinvestment Act (ARRA). Compare the specs and capabilities of rehabilitation products offered by manufacturers throughout the industry. Gas & water leak detection from Moffatt Enterprises, Fluid Conservation Systems, ADS, Crowcon Detection Instruments, Aries Industries Vivax-Metrotech, Heath Consultants Echologics, SubSurface Instruments, Rycom Instruments, Pressure Pipe Inspection Co.
Spot/Point repairs from Infrastructure Repair Systems, Masterliner, Logiball, LMK Enterprises, Link-Pipe, Perma-Liner Industries, Cosmic TopHat, Ratech Electronics, Lansas/Vanderlans and Sons and AMerik Supplies. The drilling accident in the Gulf of Mexico and subsequent massive oil leak continues to make daily headlines in all media forms. The impacts and fallouts from this disaster will continue to be felt for some time. If Congress finally passes a Drinking Water State Revolving Fund (DWSRF) reauthorization this year, it may be because of Dunkin' Donuts. A store outside Boston was the scene of a near riot in May when it was unable to offer its customers coffee because of a shortage of water caused by a breach in a seven-year old water pipe which affected over two million Boston residents. The Boston newspapers called the water disaster "Aquapocalypse." J. Marcus “Mark” Laney of Laney Directional Drilling, Humble, TX, accepted “Pipeliner of the Year” award from the Pipeliners Association of Houston. The award was presented to Laney during the association’s monthly meeting held on June 7 at the Houston Engineering and Scientific Society Building. Laney was recognized for his exemplary work in both road boring and horizontal directional drilling (HDD).